At Metameets Toni Alatalo of Playsign (and RealXtend) showed me this gadget he had. I was instantly intrigued and thought it was brilliant. Its a bluetooth based controller that knows its own rotation, directional travel and also if its being squeezed. It Is called a Blobo. 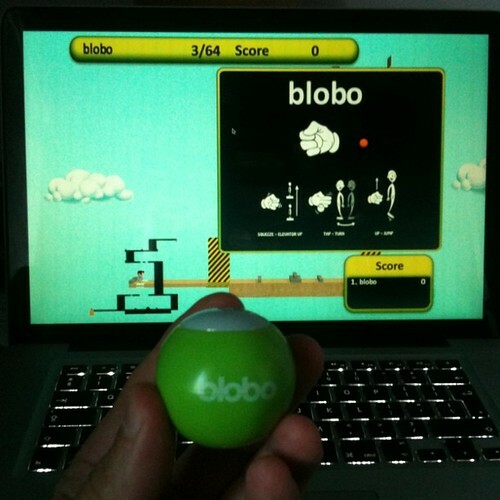 It also has some interesting features where by your avatar and some other information is stored in the ball so you can move it to other blobo owners games and play with them. On day 1 we got to another section about the grid and kicking this off was a discussion about Second Life third party viewers or TPV’s as they are called. This is a fascinating case study in both competition and symbiosis with a load of niche and specialised interests thrown in for good measure. Kirstenlee Cinquetti/Lee Quick is the driving force behind the very popular TPV Kirstens Viewer Lee has a great passion for the Second Life environment and also is very interested in photography and film making. So the aim of his viewer project was to take the Open Sourced Snowglobe code from Linden Lab and enhance it and improve it to make a very focused viewer that presents a great visual experience, as good as it possibly can be. He makes no apology for the spec of machine needed and this is where the cooperation with SL comes in. He is able to provide a focus and a niche built on top of the standard open source code to enhance some users experiences. However he is, and has to be, so on top of the releases of the code and changes to the grid (servers) that he finds things out before they go really public. When a function appears, hidden away, he and his team will find it, test it and patch their viewer to use it, or work around it if it doesn’t work properly. In many ways he is quality assurance for SL, whilst being completely independent. He said the Lab hates him 🙂 but i am sure they love him in equal measure too. It is difficulty for many commercial companies in andy industry to understand this user/developer/prosumer model. Kirstenlee is pushing the envelope with access to features that are intriguing (like stereoscopic 3d). He is restructuring major parts of code to treat the user interface in a much more engineered way to allow for cleaner layout and transparent parts of the interface. He is now looking at better camera controls, fixed views, dollys etc for the machinima makers to use. All of this is good for SL (and also the related platforms like opensim potentially). The Lab benefits from this focus, but I can imagine that it can also be difficult as when developing an releasing products time and priorities are different for different people. Next up and on the a slightly different co-op confrontational path was Melanie Thielker. She is another (of the very rare) core opensim developer and has done a lot of the restructuring work. Here though Melanie was talking about her hosted business based on Opensim Avination This venture is a growing business, with a focus on roleplay. It is very impressive to be able to both spark up and push forward a customer facing grid whilst also living in the open source development world. However that gives Melanie a great perspective on what needs to be done and real life systems architecture to keep her grids running and growing. This grid is of course in direct competition with the Second Life one, but exists because of the spin off of Opensim and the open source approach to development in taking something closed and making it better. Next we had a bit more of a standard product pitch, though it is still a leading edge idea. Fred van Rijswijk from C2K dashed in to share some of the interesting things being done with Layar. Layar is a “traditional” augmented reality application. The client allows the merging of real and virtual content based on location of the client. I say traditional as I think AR is about anything from anywhere merged with anything from anywhere else in more than one way. We do have to evolve to that though. Rather like the early web AR generally requires someone to make things for you. Design and game agencies can craft the 3d models and register them in layers to be viewed. It is interesting to consider all the content creation in various virtual worlds done by general users and how that might be liberated by AR applications? Augmenting one AR with another etc. I do like many of the Layar examples and the increasing move to go from flat HUD styles to more interactive 3d objects in space is an interesting direction. Finally for the day Tim Goree of Nokia and a rather well known metaversanlity riffed on some ideas without the aid of a power point (yay). Tim knows his stuff and I am happy he has managed to stick with it in a large corporate environment and keep pushing. Tim was musing on the avatar, not just as a single mesh used to represent you in a virtual world, but as an identity construct that flows across all digital media. He talked about some of Microsoft’s work in ultra realistic avatars (which help with the concept of visual identity) but he also talked about the underlying need to choose how and what to share with who and own your own identity. It was then left for me to wrap up, as Tim had said some cool forward thinking things I just mentioned the IEEE Virtual Environment Colab and its event coming up as validation that many people are gathering again to push the industry to the next step and not just considering moving data from a to point b (though we still need to do that). I also pointed to the Btween3d conference in London sponsored by Sony that is bringing thought leaders from lots of industries to consider the whole of the domain. In my previous Metameets post I stopped half way through day 1. So we pick up on a change in conversation this time with education. (image from http://walyou.com/street-fighter-blackboard-fight/) As I took hardly any pictures at the event! 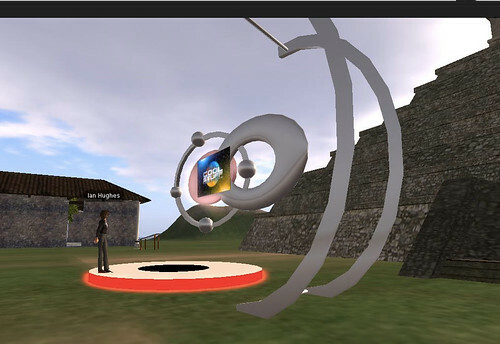 Education is always a good subject for virtual worlds yet is always a fight against the status quo. It is good to hear where the experts in the field are taking it. To continue the education theme Ineke Verheul stepped up to describe a school learning project using virtual worlds with the The Chatterdale Mystery. She described an environment that recreated a village and within that a task was set for students to travel the village asking questions of residents to try and discover the location of a bomb. The aim of this was for the investigation team to be exercising their investigative skills needed in the curriculum. It has another fascinating side though in that the people they talked to were not bots but role playing fellow students. For those students this was then an exercise in practising their language skills (in this case english). So there were in fact two lessons going on with different groups interacting in the same environment. Our final education slot of the day was down to two students Lars Dijkema and Mathijs Hamers from Elde College. We had to make a fuss of them as they had just graduated the day before, so to come and talk to us was a fantastic commitment and they arrived with a lot of enthusiasm and vigour to share their project with us. The project was a computer science one, but their mentors (such as Rick Reesen, a good friend and still at IBM doing some interesting things all with virtual world flavours) and teachers helped set them on the explore the use of virtual worlds. The overall project for the class was to investigate eco friendly and positive school environments. The guys decided that the idea they wants to explore they would do by building a virtual classroom exhibit. They quickly found that expanding that idea to build the whole school and providing a shared environment for their fellow classmates to show their ideas had a powerful social effect too. In their demo of the build the first thing that struck me was the revolving door. It was spinning away at the entrance. I thought it was just there as a graphical trick but it was spinning to attract attention because it was part of an idea to generate electricity for the school from motion of the door. I thought that was a great idea, and the visual cues and where and when I saw that will stay with me. It may have already been created elsewhere but the guys had taken the idea and implemented, then shared it and now I have that idea in my head. Great stuff! This does of course link back to Jolanda’s presentation on how to teach and engage. The ownership and drive of the students was enabled and shepherded by the teacher and the attitude of the school. Elde College has a very open attitude to the technology and what can be used and accessed. It is a model that every school should take a look at over the risk averse control mentality. 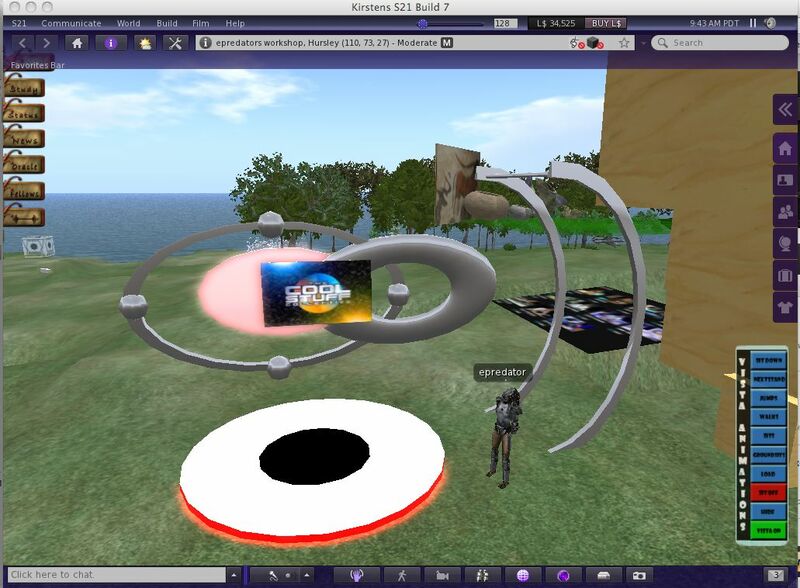 If you have strayed a little from virtual worlds recently, or if you are intrigued by the bigger environments but just don’t want to dive in fully or if you need a quick private virtual world to test and idea, or if you need a quick online 3d meeting place…. (lots of use cases) then just spend 5 minutes (or less) with Kitely. http://www.kitely.com press the register with facebook button. Create a world (there is a mini plugin to install to be able to launch) then hit launch and the SL client you have on your machine will spark up and drop you into your shiny new on demand opensim. When you create the world you can specify it is only for you or for friends. When you are not there the sim is parked in storage rather than being always on. That makes sense for most applications. The fact this is opensim too is great. The technology has got to a point where a service like kitely can build upon it. Pretty much in the time it took to read this you could have sparked up and entered a virtual world with full creative control and prim building. They have also added importing of your own oar files, and exporting too which is very handy. The images are form my little private OAR but include things like the Cool Stuff Collective set we used on S2Ep13 of the show. So far so good, it all looks very promising 🙂 I think I will have to drop this into my Opensim presentation at Develop this year to show just how far and fast things are moving. I often run a local opensim to show how I prepare presentations, which in turn could make them an exhibit. Whilst I have some live opensim servers they were for private work, never opened them up due to confidentiality. I also ever got around to sparking up another one. So now if I build a nicer OAR file of the idea. Make it available online, that OAR can be used by people who only need to have a moderate vw knowledge to create their own instance of it, or visit my instance and share with others. Just before heading to Metameets I did the late night talk with Kevin on inside avatar studio. Yesterday I popped along to the Facilities management forum where I was invited to provoke and spark some new thoughts for people at their conference. So in a virtual world talking, in amsterdam talking and in a hotel near silverstone talking. All about very similar things, but to very disparate audiences and in very different modes. Inside the Avatar Studio: Ian Hughes from Metaverse TV on Vimeo. Yesterday’s FM forum was primarily a version of washing away cave paintings, with a lot of The Cool Stuff Collective pieces as a check a balance to say this stuff is really real you better take note. I may have to borrow the term that was used in the next session, that I also stayed around for yesterday to discuss social media usage. We saw a fairly typical evolution of ideas and bands of adoption, worries and concerns and ultimate success stories shared with the group. However the stand out phrase that was circulating was ROI is Risk of Ignoring. Which is so succinct and brilliant its hard not to use it more. At the FM forum I had a great conversation too in which we jammed on the 3d printing changing the world concept and ended up at a challenging thought around the vanilla nature of a world where anything can be re-replicated anywhere and whether or not innovation would spring from that or just stable copies of everything for everyone. I had not thought about it that way before so I need to explore that now! This years Amsterdam based Metameets had a diverse and intriguing group of people present and attending online. It was also running in parallel with the 48 hour Machinima festival MMIF. When I was asked if I would moderate the event I did not take much convincing and I am very glad that I did. MC’ing an event can be done in two ways. Stand up, introduce the links and sit down again, or pay attention to it all and try and explore some threads in what has been said. I tried to do the latter, which meant paying total attention all the time. This is mentally tiring, but balanced by the fact that everything, without exception was intensely interesting! One of the key things about Metameets is the diversity and clashing of worlds, and some new perspectives. This is the vision the Joja brings in organising and gathering us all for this event. Our two opening keynotes started that ball rolling. Corporate HR Catalyst for change and Legendary Games Developer. So we had two presentations on seismic changes, both made analogies to both evolution and exploration combined with a risk taking pioneering attitude. So I knew we we off on the right track as a conference. We then had some focus in the agenda on Opensim. This was great as this was scheduled as some technical discussion for the tech’s in the room and some business discussion for those who want to just use virtual worlds like Opensim. First up was Justin Clarke Casey, a core Opensim developer known to many of us. I know Justin from back in the IBM days and also we live in the same area. It was good to see him get up and explain his vision of where Opensim is going. Much of this was focused on the gradual evolution to the generic interconnected hypergrid. Where your own opensim is able to interact with everyone elses. This does happen now but architecturally the hand over of you to another sim is evolving and Justin could see a time, and a gap for certain common services (akin to DNS) were available to broker this. It shows just how complicated evolving a grid is and the potential security implications and stability problems. At the same time it all looked like it was going the right direction. Next Ilan Tochner from Kitely stepped up to discuss his companies approach to creating virtual worlds on demand. 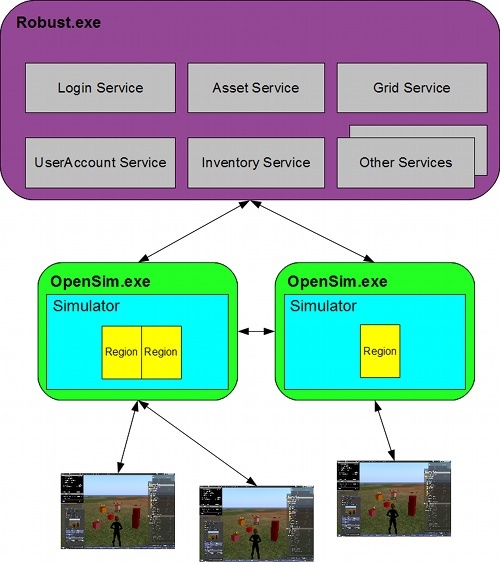 In this case they use opensim, though the principle can be used to start to drive any appropropriate platform. llan vision is to be the Telecom company of the virtual world. Providing some middle ground of communication/hosting etc. Though without the rip off data charges 🙂 The principle is you go to the site, press a button (a large one to attract your attention) this provisions a virtual world for you. You then dive into it and invite others. When you don’t need it anymore you either park it (in storage which is very cheap compared to leaving a server running) or delete it. There are a few companies trying this but Kitely and llan are very active in driving standards and supporting the growth of the industry with a more open approach. llan had some interesting directions for the viewers too. Mirroring what happened with the web and mobile in the early days and moving to transcoding of any viewer code to a suitable renderable platform. Plugin and client free access. You can see why this would appeal both to users (no messing around) and to a service provider like Kitely. If virtual world y suddenly appears you need to be able to provision a y and get users logged on with y’s client. We had lots of back room chat about standards, common approaches, generic versus specialist interfaces. All good and the right sort of conversations to have. So there was a clear link and need here to push certain function and responsibilities into areas (like a generic avatar service?) into a real layer. From both a service provider of generic virtual worlds and a developer of the core of one the requirement and the evolutionary path was similar. coming up education, AR and path to the future to round up Day 1! This is a really quick one but very related to the initial Metameets post about machinima I just did before my mega post I need to do later. On getting back home the Predlets had bought me Dirt3 for Fathers Day. I could not resist this integration. The walled garden (but very effective) Xbox 360 links directly to your youtube account and you can publish parts of your replay. There are a few controls on speed and clipping etc. It works though. I think the stunt section will be interesting, the racing is good but very similar for everyone. (not got to that this was only my 3rd go). However, it lets me capture my experience in my context and share it. This sort of thing has been done before to some degree, blur tweeted for instance. The next few days are both busy,exciting and enjoyable with a bit of pressure thrown in for good measure. The tomorrow I jump on a plane bound for Amsterdam, on the same flight with Justin CC or opensim fame so the southampton virtual world massive is on tour. We, and lots of our european fellow evangelists are heading to Metameets which is always the most vibrant gathering on the subject, mixing art and business and innovative ideas. See you there too ?